Leeks are the unsung heroes of the allium family. This tall cousin of onions and garlic looks like an overgrown scallion, but features a sweet and buttery flavor that is hard to beat during the colder months. They can be used as a mild replacement for onions in most recipes, and partner well with hardy root vegetables in soups or roasts. 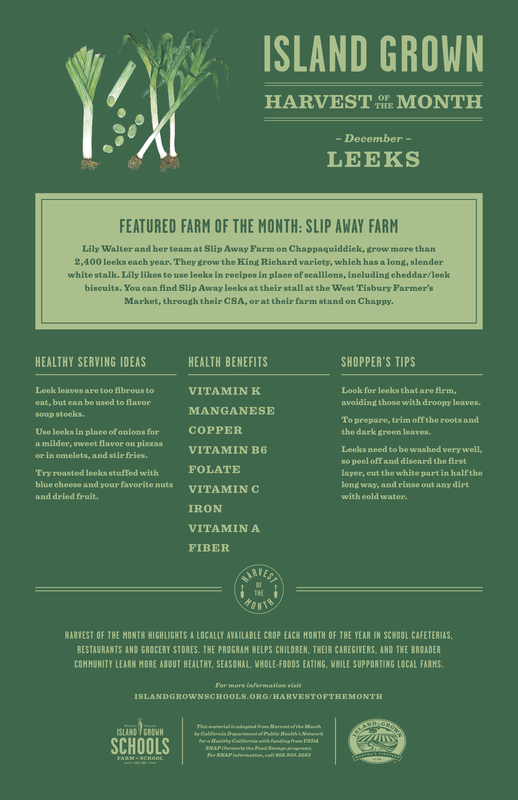 You can also try our featured recipe of the month, Leek and Lemon Rice, for a delicious (and nutritious!) idea to work leeks into a weeknight meal. Personally, I love greedily eating them by themselves after a quick trip to the oven and a drizzle of olive oil. You should try it all. When shopping for leeks, look for firm greens that don't droop. Leeks almost always have dirt hiding within their layers, so it's best to chop off the dark green tops, trim off and discard the outermost layer of the leek, then cut the remainder in half length-wise before giving it a thorough rinse. The green tops are super fibrous, so you can save those for use in a soup stock or as braising greens for dishes with longer cooking times. For more information, check out our Leek Information Poster here. Our featured farm of the month is Slip Away Farm on Chappaquiddick! They grow more than 2,400 leeks a year amongst all of their other amazingly gorgeous vegetables. You can find their produce through their CSA, at their farm stand on Chappy, or at the West Tisbury Farmer's Market during the growing season.